The Tupolev Tu-204 is a twin-engined medium range Russian airliner capable of carrying 212 passengers. 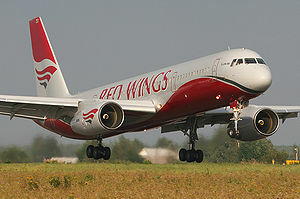 First introduced in 1989, it is considered to be broadly equivalent to the Boeing 757. It was developed for Aeroflot as a replacement for the medium range Tupolev Tu-154 trijet. Tu-204 was designed as a family of aircraft incorporating passenger, cargo, combi and quick-change variants. The Tupolev Tu-204 can be powered by either Aviadvigatel PS-90 or Rolls-Royce RB211 engines. It is produced at two of the largest Russian aircraft manufacturing plants in Ulianovsk (Tu-204 series) and Kazan (Tu-214). The Tu-204 cabin is available in several layouts, including the baseline single-class layout seating for 210 passengers and a two- or three-class layout designed for 164-193 passengers. A cargo version of the Tu-204 is being successfully operated by several airlines in Europe and Egypt. Both economy class and business class compartments are provided with passenger seats with 3+3 and 2+2 seating arrangements, respectively. The business class cabin has a seat pitch of 810 mm. The passenger cabin can be divided into compartments according to class with removable bulkheads and curtains. Compartments are illuminated by reflected light. Hidden lights located over and under the overhead bins create uniform and comfortable illumination. Overhead bins for passenger baggage and coats are of the closed type. The volume of baggage per passenger is 0.052 m�. In 1994, the first certificate for Tu-204 aircraft (with PS-90A engines) was issued. Subsequently issued certificates have extended estimated operational conditions and improved overall aircraft type design. The Tu-204-120 variant, certified with Rolls-Royce RB211-535E4 engines, complies with noise regulations described in Chapter 3 of Supplement 16 to ICAO, hence meeting all current European and ICAO requirements. It is currently undergoing the certification process with JAA. Besides, the Tu-204-100 variant, certified with PS-90A engines, complies with noise regulations described in Chapter 4 of Supplement 16 to ICAO which means it's more quiet. The aircraft was certified to Russian standards AP-25 (harmonised with FAR-25 and JAR-25). The Tu-204 is the basic passenger airline model, and the Tu-204C is the basic freight or cargo model. The mostly used models are the -100C and the -120C. This is the initial version, powered by Soloviev (now Aviadvigatel) PS90 turbofan with thrust of 157 kN (35,300 lbf). It uses Russian powerplants and avionics. It was certified in January, 1995. The Tu-204-200 is a heavier version with extra fuel for more range. Only one has been built by Aviastar-SP in Ulyanovsk but not yet delivered (RA64036). Now this version is only produced by KAPO in Kazan and marketed under the designation Tu-214. The Tu-204-100C and Tu-204-200C are the cargo versions of the -100 and -200 respectively, fitted with forward main deck freight door. Currently the Tu-204-100/200 is offered with the option of uprated Aviadvigatel PS90-A2 turbofan, which promises 40% longer period between overhauls. The Tu-204-100 has a maximum take-off weight of 107.5 tonnes and range with 196 passenger in 2-class configuration is 6,000 km (3,300 nautical miles). In order to broaden the product appeal, the Tu-204-120/220 features non-Russian avionics and engines. It is powered by 2 Rolls-Royce RB211-535 engines each with thrust of 192 kN (43,100 lbf). Cairo Aviation of Egypt became the launch operator when it took delivery of a Tu-204-120 and its cargo version the Tu-120C, in November 1998. The Tu-204-220 and Tu-220C, cargo version, is a higher gross weight variant of the basic Tu-204-120. The Tu-204-120 has a maximum take-off weight of 103 metric tons and range with 196 passenger in 2-class configuration is 4,600 km (2,500 nautical miles). It is a shortened, longer range and more efficient derivative of the Tu-204. It is about 6 meters (20 ft) shorter than the basic Tu-204. It is available in two versions; the longer ranged heavier version powered by Aviadvigatel PS90-A2 turbofan has a maximum take-off weight of 107.5 metric tons and range with 166 passengers increases to 9,300 km (5,000 nautical miles) and the lighter shorter ranged version with a maximum take-off weight of 89 metric tons and range with 166 passengers is 3,500 km (1,900 nautical miles). Russian airline Vladivostok Air is the launch customer. This airline's aircraft are in the two-class seating configuration with a capacity of 142 passengers. It is also operated by Air Koryo which currently operates one Tu-204-300 and has one additional aircraft on order with options to replace five Тu-154s and four Il-62Ms. The Тu-204s operate on the Pyongyang-Beijing, Bangkok, Singapore, Vladivostok and Shenyang lines. This is a version of Tu-204-300 optimized for shorter routes, featuring smaller wings, increasing cruising speed to Mach 0.84, making it a competitor to Next Generation Boeing 737. It is ETOPS rated and fitted with Honeywell 331-200ER APU. Picture - The planned experimental Tupolev Tu-206. Tu-214 is also a variation of Tu-204. It is technically a Tu-204-200, one of the differences being that it is built by a different factory. Planes designated Tu-204 are produced in Ulyanovsk by Aviastar-SP; Tu-214 in Kazan by the Kazan Aircraft Production Association (KAPO). Both factories are independent from the Tupolev design bureau and have some control over the design of the variant they produce. The main difference is a full-size main door at the left side of the fuselage just before the wing. The Tu-204 has two main doors and 2 emergency doors; the Tu-214 has 3 doors and one emergency door. In 2010 a total of 10 Tupolev Tu-214 aircraft are in airline service with a dozen on order. Tu-214 users are: Rossiya (5), Transaero (3) and Airstars (2). Transaero has an additional 7 orders for the aircraft. The Tu-204SM is an enhanced version of the Tu-204-100. The aircraft will be powered with the Aviadvigatel PS-90A2 engine, certified in 2009 on RA-64048. The Upgrade comprises a two-crew flight deck, new avionics, new air conditioning system and a new flight control system. Atlant-Soyuz will be the launch customer of the aircraft instead of Iran Air Tours, because of Pratt & Whitney association with Perm Engine Company to manufacture the engine. The first flight is planned for 2010, with deliveries starting from 2011. Sources: United Aircraft Corporation, Tupolev. There have been no fatal accidents involving the Tu-204, but regular incidents since the beginning of the commercial operation. On March 22, 2010, Aviastar Flight 1906, flying an Aviastar Tupolev Tu-204 tail number RA-64011, crash-landed short of the runway near Moscow's Domodedovo international airport while attempting to land at night in fog and poor visibility. There were no fatalities, but four of the eight crew members were seriously injured. It was a repositioning flight with no passengers on board. The cause of the incident is under investigation.